Completing and signing forms are daily routine for many businesses, with the majority of documents in PDF format. Until now, you were required to print the forms after filling in all fields with your details, then sign and send manually by post, fax or by scanning it back to an electronic format. This manual and cumbersome process is no longer neccessary with the online, automated solution Secured Signing offers! With our solution you are able to fill in any form and sign it with just your mouse and keyboard! Simply pinpoint fields on the form with the appropriate details you want to add, and sign. Upload your current form and design your online approach for invitee to fill-in and sign. Multi Lines Text Box – Add a box for invitee to fill-in multi lines for large amount of text. 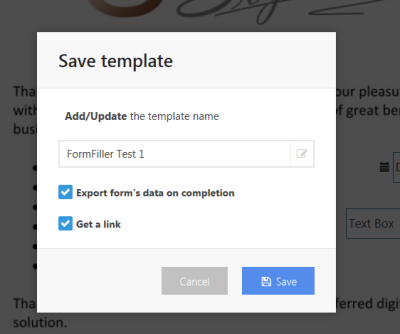 Form filler supports form filling initiation from your website, save the form filler template ticked the box to get the link. Once the form filler fill-in in at your website, invitee click to sign an authentication code sends to invitee’s email, signing process will complete only by entering the code. Document owner will receive a CSV file in the email completion with the signed form. The data file can be import to any system to avoid data double entry.